What can I say, I’ve never really liked making resolutions. You always end up forgetting them by the end of the year. So I’m going to start a list of what I’d like to do this year. I might put it up on it’s own page if I can remember to update it. The great thing about a list is that it can be updated as the year goes on. Have you started your to-do list? Get going! Last week was a great way to end the year. It’s helping me to focus on the next year, which really needs focus. As a condition for your admission, you must earn a grade of B or better in all courses by the end of the semester. That motivated me to do better in my classes this past semester. A bump in the road at the end kinda derailed that. So I e-mailed the person at Gallaudet to let them know this. I was informed that I had misread the letter and the condition applied to fall semester at Gallaudet. I will be attending Gallaudet University in the fall as a Graduate Special Student. I am going to be going to Gallaudet! Part of me still can’t believe it. When I stop to think about it, a huge smile appears on my face and my mood lightens. Even worrying about how I’m going to pay for it doesn’t diminish my mood. But this does mean that a lot is going to change next year. I’ll be moving to DC, away from my hubby. I’ll have a whole new campus to get to know, new people to meet, new teachers to learn from. And of course, finally getting to use ASL to communicate all the time! I just need to make sure to focus and keep my grades up. My continued attendance and hopeful acceptance into Linguistics depends on it. I have been struggling with a major decision recently and I think I’ve finally come up with the best solution. As you all know, I’m working on getting into graduate school to study linguistics with a focus on sign languages. As much as I do want that as the end goal, I’ve realized that starting out in linguistics might be too much for me. I have a very basic idea of what linguistics is. Couple that with the pressures of graduate school, and, hopefully, being in an environment where my second language (L2) is the primary language being used. I was always planning to apply to Gallaudet as a Graduate Special Student, but I think I’m going to do that for OSU as well, and no apply for linguistics at all. It does seem weird at times when I think about it, but it feels right. That is the more important thing. I need to feel comfortable and confident when I start in linguistics. I don’t think I’m there now. But a year taking graduate-level classes without being in a specific program would give me the freedom to take a variety of classes and really get a feel for graduate school. But, why am I telling you all of this? In American society, it is expected that you get a degree within a certain amount of time. You ‘should’ earn an associate’s degree after 2 years. You ‘should’ be an undergrad for 4-5 years. You ‘should’ work on a master’s for 2 years. I am tired of the ‘should’ people and am going to do it my way. Pretty much like how I try to approach life in general. I need to be going at the pace that works for me. So should you! You shouldn’t be going at any pace other than your own. Now, that doesn’t mean you shouldn’t be working on moving forward with your life. The world keeps moving forward, so should you. But if you feel that others’ expectations are higher or faster than yours, sit down and figure out why and how you can get things done at your pace. Now I need to go get things organized and really get those applications finished. Wish me luck! Tomorrow night begins Silent Weekend #130! That means today is prep day. This morning I made up another recipe from Choosing Raw, Buckwheaties. I also made up two pint jars of Chai. Then this afternoon I bought a couple more ingredients and made up two batches of Chocolate Raw-Nola (from Choosing Raw) using the Buckwheaties I made this morning. It’s more of a granola since I don’t have a dehydrator and had to use the oven. Tonight I’m going to chop up a bunch of carrots and broccoli, clean a bunch of green beans, and make up another batch of iced green tea. I’ve got hummus and tahini dip ready and waiting. Yesterday I bought a bag of apple straws and a box of multi-grain pita chips from Trader Joe’s. Tomorrow I’ll just have to fill up my Klean Kanteens with water, load everything into the cooler and bags, and get ice for the cooler. Can you tell I’m excited for the weekend?! Aside from a wonderful weekend of ASL and camping, it’s also an opportunity to eat healthy and high raw! That really is the best way to describe my life lately. I have been trying to balance work and school and personal time. It has been crazy. But there are a few things that have helped me along the way. I’ve been trying to give myself a regular schedule. Which can be hard since I’m basically an independent contractor whose paycheck depends on people to need rides around the city. But I have managed to always give myself 2-4 pm off. Whether it’s from school or from work, I spend two hours at home doing whatever I want. That is helping me to stay sane. Having people who I can talk to about my frustrations with one thing or another helps as well. Whether it’s about classes or about work or about something else entirely. Having someone who is willing to listen, and sometimes give advice, is so important. This past weekend was Silent Weekend #129. Just being able to go camping and spend the weekend with friends and other ASL lovers was wonderful. A really refreshing weekend. Well, it would seem that I have 3 Ss getting me through life right now. Hopefully soon I’ll have the time to share a few other things that have been helping me. But I need pictures to do that! When I checked the book out of the library, I thought it would be comparing spoken language and ASL cultures. Wrong! 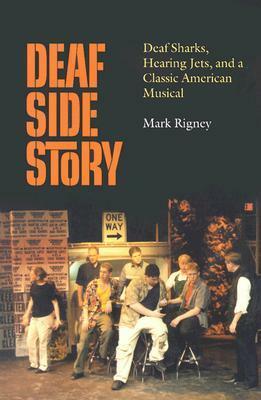 Deaf Side Story is about a production of West Side Story done in 2000 at MacMurray College in Illinois. The Drama professor decided to have the Sharks be students from the Illinois School for the Deaf, which was in the same town as the college. The book follows the production from when the professor first has the idea to after the last performance. The author does an amazing job of chronicling all the trials and problems that arise when you are not only dealing with two worlds, but trying to have them together on stage and make sure the audience has full access to the entire show. It’s a great read for anyone interested in ASL culture. If you have no prior knowledge about it, don’t worry! The author takes the time to explain various aspects of the culture and the language so reader fully understands why things are the way they are. It’s a great book and is a great way of showing that a difference in languages doesn’t have to mean it’s impossible to work together. This is my mantra right now. Thankfully I rarely have to think it because my brain seems stuck in that mode. Yesterday the letter from Gallaudet finally arrived. Unfortunately it was a polite no. But after some tears, I have been focusing on all the positives that I can, and more keep coming up. My life has now unfrozen and I can plan out the next year. I can now work on getting my credit cards paid off, my student loans paid down, and get my finances in order. I can now plan on what costumes I’m going to wear for Halloween this year, to Marcon next year, and continue to work on getting in better shape for Dragon*Con next year. I can take day classes and experience other teachers, and continue to work on my interpreting skills. I can really get involved in the Deaf/ASL community here in Columbus. I can apply again next year to Gallaudet and other schools. Unless I find over the course of this year that I don’t need to go to grad school to have a career I enjoy. Now that my long-term has unfrozen, maybe I can get my short-term in gear again! The motivation is starting to return. I love the blog Bonzai Aphrodite, in case you didn’t know that by now. But something Sayward said in today’s post got me refocused on my future goals. My dream, now, is to be a science writer. Did you know that? Dreams always seem to sweep out and away from us, and then somehow to circle back. Or, at least mine always seem to that. Like this one did, and I find myself just where I was 6 years ago, dreaming of writing popular science. Of taking those stodgy, sterile scientific papers and breaking them down, synthesizing them, so that this fantastical, magical world of science feels approachable for anyone and everyone. But in order to be a brilliant science writer, you first have to read the brilliant science writers. That is part of why I want to get a Master’s degree and probably a Ph.D. in Linguistics with a focus on signed languages. I want to share with the world what an amazing language this is. In doing research for a presentation for class, I ended up reading a few papers that I just could not finish because they were so dry. What they were talking about was really interesting and important, but dry. Granted they were written for people in those fields, but it still got me thinking about what it might look like if it wasn’t so dry. But recently, still waiting to hear back from Gallaudet, I’ve been wondering if this is what I really want to do. Do I really want to go to school for another 5 years? Do I need a Ph.D. to do what I want to? Why don’t I just do the work and teach ASL? But reading that has refocused my thoughts and I feel like I’m back on track. Luckily, all those thoughts that had me doubting also help give me focus if I don’t get into grad school. There’s lots I can do here in Columbus while I apply again and wait to hear again. But I’m still hoping that is something that I won’t have to worry about because I’m going to get in. I love Silent Weekend! But this may have been one of the best weekends yet. My confidence in my signing has never been better, and I really felt it this weekend. It was so nice to be able to just talk without having to think about it. I just let the words flow from my hands and body. It was wonderful. Not a lot happens on Friday. Everyone’s arriving, signing in, getting their stuff out of the cars and into the lodge/dorm/sleeping areas, and getting warmed up for a weekend of signing. But I did break out the video camera and got quite a bit of taping done. I can’t wait to sit down and get all of the videos ready to go for sharing. Saturday was quite a busy day, as usual. More people arrived, including another friend/classmate, and a former teacher whose been extremely supportive and helpful this semester! In the morning, I went on the hike out to Split Rock where I took a bunch of pictures of the amazing views, hurt my hand a little, and lost my phone. Thankfully a bunch of people stayed behind to look for it and one of them found it. My heroes! That afternoon, I got to execute my idea for silent Cards Against Humanity. I made it a rule that you couldn’t fingerspell just because you don’t know the sign. Everyone took it a step further and tried to avoid fingerspelling as much as possible! It was great! My former teacher, current teacher for many playing, helped us out. It was almost more fun to watch his reactions to the white cards than what the cards were. Later that night we watched two of the ASL movies I brought. The first one was projected so everyone could watch. But the person whose laptop we were using needed to get going. So I set up my laptop so we could watch the second. At first it was just me, another student, and my former teacher. By the end we had gained at least three other people. At one point there were ten of us watching the movie. It was great! Totally worth going to bed at 1am. Sunday I got up at 8am despite being tired because that’s when breakfast was, and I needed to get everything packed and ready to go for later. Breakfast was relaxed and leisurely because the only other thing that day was the closing, “Voices Back”, meeting. I love the “Voices Back” meeting because first-timers get to share their experiences, and that’s always fun to hear. Overall, a great weekend. I got to meet a lot of new people, hang out with people I already know, and improve my ASL skills. Definitely a success!